A very ornamental form of Alder (not the ornamental sense that you could put it on the mantle piece next to the cheap tat your Mother In-law got you last Christmas). It has fine and deeply cut leaves making it a great specimen tree. Used in parks and gardens for these very ornamental qualities and has a high resistance to urban pollution. 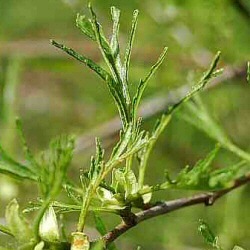 Considered a fast growing tree suitable for almost any soil except chalk and will perform well in damp or boggy sites. At the time of writing the Cut Leaved Alnus Glutinosa Imperialis held the RHS Award Of Garden Merit which basically means it performs very well compared to other Alder trees. Feel free to severely prune to shape or promote new growth as it will shrug its branches and just grow more. Will tolerate full sun and shade positions with characteristics likely to attract wildlife. Fully UK hardy so you can plant almost anywhere in the UK and not worry about it being killed of by the cold. This tree is supplied at a height of between 1.5 and 2.4 metres in a 7-12 litre container for year round planting and better results than from bare-root stock. Expect a final height of between 5 and 10m depending on local weather and conditions.